The action oriented planet, Mars is chiefly responsible for imparting the never say die attitude in us. We strive hard to achieve things in life and wonder, what is the driving force behind this attitude of fighting every obstacle thrown our way? That’s what Mars imbues us with. The planet governs the violent and passionate tendencies in our behaviour. It makes us initiate and kick start the plans we’ve been keeping in the kitty for long. Lord of the Zodiac signs Aries and Scorpio, Mars holds the laurel for bring the active and go-getter planet. It radiates naturally malefic energy, but despite of that, the planet infuses us with the strength to fight off our enemies and stand up for ourselves. A strong Mars makes you adventurous and courageous. You have a strong body and are full of life and vitality. But, a native with strong Mars (in own house – exalted) will result in having a violent tendency and a bold and brazen attitude. However, a weak Mars is responsible for a timid and meek personality. The person will lack what it takes to throw an enemy to the curb and will always remain a shadow in whatever he/she does. Blood disorders are also pretty much likely with a weak Mars. Anaemia, Leukemia, and Blood Pressure related woes will strike their well being. The Red Planet, Mars would transit into the Zodiac sign Leo on August 27, 2017 (Sunday) at 08:51 a.m. The planet would remain posited there till October 13, 2017 (Friday) at 16:25 p.m.
Transits are responsible for harbingering major changes in our lives and that’s what this Transit of Mars in Leo promises. Find out what your sign has in its kitty for you. 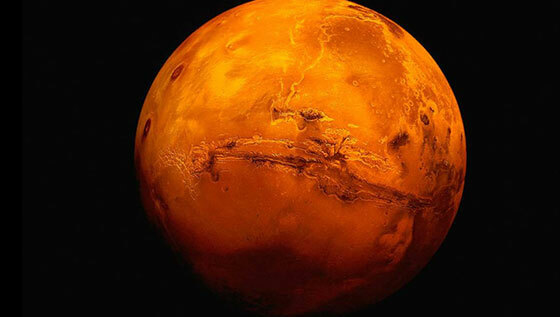 Get to know about Planet Mars in detail. Planet of action, Mars would transit into the 5th house from your moon sign. In this duration, you’ll be inclined towards earning and learning new things. You’ll try to enhance your knowledge on varied topics and will put it to great use. Love life will have to face minor issues due to your sharp speech. You are advised to keep it light in your relationship and do not be bitter about anything. Make your relationship as transparent as possible. Children will have to keep their health in check, as chances are that they might have to face high fever or blood related ailments. Spouse will achieve gains in this period. He/she will be grateful to you for the strength that you’ve provided them with. You are advised to put tabs on what you eat; refrain from consuming junk food in this period. Remedy:Chant the mantra: Aum kraam kreem kraum sah bhaumaya namah !! The go-getter planet, Mars would transit into the 4th house from your moon sign. This indicates some tiffs and arguments at the familial front. You’ll feel discontented at home due to lack of harmony. However, you won’t let this control your mind and will focus at acing at your professional arena. You are advised to take care of your parents’ health; make sure that you are in perfect sync with their well being. Mother’s health needs special attention. Spouse will likely receive a good position at work. However, your bold attitude will give your partner a hard time to cope up. This might become a major reason for the bitterness in your relationship. The silver lining for you in this period would be your income growth. Remedy: Donate pomegranate on Tuesdays. Mars will transit into the 3rd house from your moon sign, denoting an all time high in your stamina and energy. You’ll be full of vigour and strength. Any short trip undertaken in this period would prove to be fruitful for you in the long run. Legal cases and disputes would give you a chance to shine on and win. Natives involved in sports, management, and marketing will benefit in this duration. This period would give them a fair boost to strive for getting a feather in their cap . You will earn through your own toils and efforts; although, you are advised to abstain from over exerting yourself and falling prey to any ailments. Parents will have to step up their efforts in order to stay at the pink of their health. You might think about changing your job in this period. During this transit, planet Mars would move into the 2nd house from your moon sign. During this time period, you’ll be able to accumulate enough wealth to satisfy your needs. The money inflow would keep you contented. Your speech must be your major concern in this duration. You might become harsh in your conversations and your cocky attitude might sour your relationships. Students will be focussed on their education. This would help them achieve their goals and set some new ones. Health of spouse is likely to decline in this period. Government officials will be kind enough to offer you a helping hand. Businessperson would enjoy lucrative returns in this duration. Remedy: Wear Anantmool (Hemidesmus) around your neck or arm, as per your convenience. The planet Mars would move into the ascendant . The time advises you to exercise restraints on your aggression and temper. Planet Mars might try to influence your speech and temperament. In this duration, you’ll face issues in your personal, as well as professional life. Marital life won’t stay afar, as you’ll fish for issues to meddle in your peaceful life. You might try and dominate your partner in this duration. At work, you might get dragged in a controversy, prone to bring you defamation. Various gains are probable for you in this period. Father’s rise is also predicted. You’ll work hard to fulfill your life goals. Albeit, you will lack mental peace in your life. Remedy: Establish Mangal Yantra on Tuesday. The planet Mars would be transiting in the 12th house from your moon sign, signifying a steep rise in your expenses. You’ll have a hard time keeping tabs on your pocket. Going and residing away from home is predicted for some. You are advised to stay away from doing any illicit activities, as chances of facing legal charges due to that are there. Provided there are combinations of denial of this in your horoscope. This period would make you shell out on medical treatment and litigation. Your siblings, although, will have a brilliant time due to their associations with foreign countries. Spouse's health would require your attention. Keep a check on what you eat and in what proportions. A difference of opinion could be apparent in your marital life. Remedy: Donate red lentils on Tuesdays. Planet Mars would transit into the 11th house from your moon sign. This period will bring in high gains in your life. You’ll enjoy accumulating wealth and shaping up your future in this duration. A long awaited wish will see the dawn of completion. Although, your love life might have to face some hiccups. Your spouse will play a major role in your prosperity. In this duration, you would spend maximum time socialising with your spouse, friends, and family. Children’s health will require attention. Rivals will have a hard time coping up with your aura, as you’ll blind them with your success. Remedy:Feed gram and jaggery to monkeys on Tuesdays. How 2017 would turn out to be according to Numerology! Click here . Planet Mars would move to the 10th house from your moon sign, denoting good chances of growth at professional front. You’ll focus on making something out of your career in this duration. You’ll gain in authority and position at work. Some controversies are probable in this period. You might act aggressive in terms of achieving big things in your career. Government and higher officials will be kind enough to extend a helping hand to guide you out of the chaos and into prosperity. Some tiffs at home will keep you stressed out. Mother’s health might decline in this duration, if not taken proper care of. Love life will have to board a rollercoaster in this period. Ups and downs are predicted, but nothing that couldn’t be tended with some love. Children will have a hard time coping up with their well being. The period of Mars transit would give you hiccups in sparing time for familial bonds, due to ethical duties at work. Remedy:Observe a fast on Tuesdays. Mars would transit into the 9th house from your moon sign. This move of the planet would directly influence your mindset. You’ll be devoted and dedicated to work harder and achieve bigger things in life. Father’s health would require your attention. Make sure that you give him a balanced diet to keep him in the pink of his health. Chances are that there might be some ideological difference with him, which, you’ll have to sort out. A good news might knock at your door in this duration. Some might consider going for a degree from an overseas university in this period. Long journeys would prove to be fruitful. Love life would run smooth, albeit you are likely to have some temper issues with your life partner. Glory is on the cards for you. A job change would bring you good fortune, despite of that you are advised to take every step with caution. Remedy: Offer sindoor at a Hanumana Temple every Tuesday. The red planet would transit in the 8th house from your moon sign, affecting your health and well being. You are advised to pay attention to what you eat and in what proportions. There is a slight possibility that you might have to suffer through injuries, accidents, blood related irregularities, or perineal diseases. You might also have to undergo a surgery in this duration. As per the planetary positions, you are advised to drive carefully. Any harshness in speech might result in a tiff with the partner. Despite of sudden wealth losses, you might also gain some in this period. Relationship that you share with your siblings will have to go through a blizzard in this duration. Their health is also predicted to decline in this period. Remedy:Worship Lord Ganesha’s orange idol, daily. The planet of strength, Mars would transit in the 7th house from your moon sign. Promotion or an increment is on the cards for you. Marital life will have to go through a turmoil in this period. Heated arguments will strain the relationship that you share with your partner. Both of you will be quite opinionated about each other, and will try to dominate one another. Your argumentative and aggressive side would be on the forefront in this duration. Your spouse will receive gains and their professional status would enhance. Children would become passionate towards their respective field and will try hard to soar high in it with flying colors. Remedy: Donate wheat grains to a Brahmin on Sundays. Planet Mars would transit into the 6th house from your moon sign. You’ll have to struggle hard to achieve things in this duration, but this would make you all the more determined to set things straight and get what’s yours. You would taste success in competitive examinations. You’ll outshine your rivals in this period. Litigations have a good chance of ending up in your favour. On the other hand, your spouse will have a hard time maintaining their well being. Expenses are expected to skyrocket in this period. Wealth losses would make you feel disheartened. But, success will follow suit to cheer you up. You’ll watch yourself go highly determined towards achieving your professional goals and accomplish all that you’ve aimed for. Remedy: Chant: Aum Bhumiday Namah ! We at AstroSage, hope that Mars Transit in Leo only harbingers good things in your life! May you achieve all that you aspire for and soar high!